in an old graveyard by a pedestrian railway bridge. This is a general view of the west face of the pillar at Tybroughney. A centaur proceeds to the right, two four legged animals walk to the right above the centaur. There seems to be another animal under the animal on the left. Carrigan, W., The History and Antiquities of the Diocese of Ossory IV 1, , Dublin (1905) . 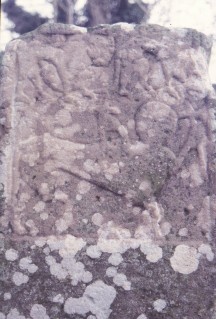 Crawford, H. S., , ‘Description of a Carved Stone at Tybroughney, Co. Kilkenny’. In Journal of the Royal Society of Antiquaries of Ireland (1908) 38, 270-277. Maher, J., Romantic Slievenamon, in History, Folklore and Song 1, , Mullinahone (1955) . P., , , ‘A Curious Inscribed Stone at Tybroughney’. In Journal of the Waterford and South-East of Ireland Archaeological Society (1897) 12, 47-48. P., , , ‘Archaeological and Literary Miscellany’. In Journal of theWaterford and South-East of Ireland Archaeological Society (1909) 12, 49-55. Roe, H. M., The High Crosses of Western Ossory 2, Kilkenny Archaeological Society, Kilkenny (1969) .